Hotel Atlantis, The Palm is now open. The grand opening party at a cost of US $20 million was attended on November 20, by over two thousand film stars, pop stars, super models and billionaires from around the world. The inauguration was followed by the largest display of one million rocket firework display with 100 computer guided rockets, seven times bigger than Beijing Olympics. The US $1.5 billion mega resort with 1,539 rooms is located in Dubai’s Palm Jumeirah artificial island. the first resort to open on Dubai’s Palm Jumeirah artificial island. the resort encompasses a 46 hectare site. Aquaventure: a water amusement park with 18 million litres of water. The Ambassador Lagoon: an 11 million litre marine habitat with over 65,000 sea creatures. The Lost Chambers: offering underwater views. Dolphin Bay: a 4.5 hectare dolphin education and conservation centre. has seemingly endless stretch of beach. has numerous dining choices including four celebrity chef restaurants, an exciting nightclub, a Spa and Fitness Club. has 5,600 sq metres of meeting and function space. Here is the layout of Atlantis, The Palm resort as pdf document. Here is an amazing video clip of the grand opening of Atlantis, The Palm in Dubai on November 20. Here is another video clip that highlights the features of Atlantis, The Palm. Read more about the grand opening of Atlantis, The Palm from Times Online. 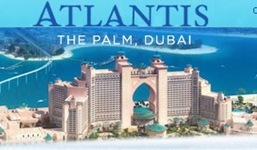 For more information log on to Atlantis, The Palm. The entire Palm Jumeirah island and Hotel Atlantis, The Palm were lit up in a spectacular fireworks display, marking the official launch of the iconic landmark and its flagship resort. View amazing photographs and read report from Nakheel. Some more amazing photographs of Atlantis, the Palm are at Fun on the Net.